Yet there’s not a huge amount of space at Constellation Station for all of these buses. Compared to the other busway stations that act as interchanges it’s the smallest, in most part because it’s missing an online Northbound platform, something that won’t be delivered until the busway is extended. Even worse is now in the evening peak the NX1 and NX2 need to loop back around again. 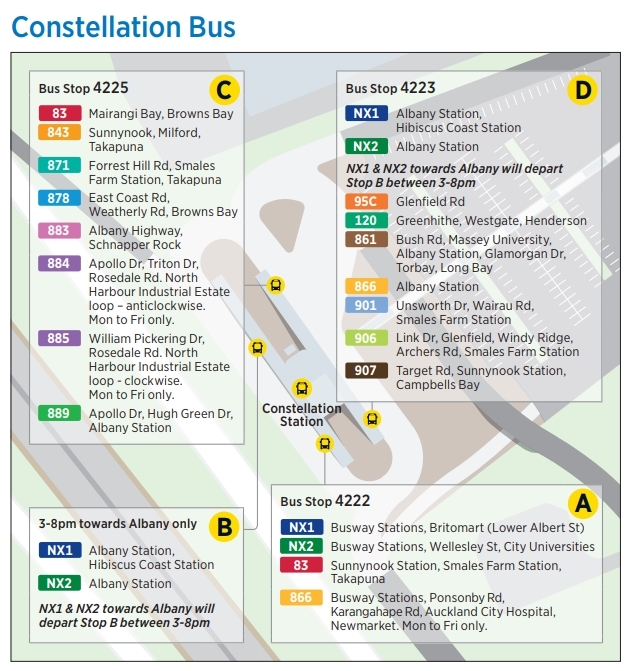 In the medium term, the Northern Busway extension and proposed Rosedale station will take pressure off Constellation and provide a useful extra connection between local services and busway services. But that project is a few years away. It’s also unclear at this stage if the bus congestion will then just be transferred to Albany Station. So I wonder whether in the very short term Auckland Transport might need to repurpose some of the nearby Park and Ride spaces for laying over buses, or for stops for local buses. Perhaps a roundabout or two, would help local buses avoid some of the looping around and therefore help reduce conflicting bus movements. Auckland Transport are going to need to do something and fast. This is why planning for an upgrade to the Northern Busway needs to proceed urgently. Ultimately there will just be too many buses using the busway for it to function effectively. Are all the buses on the same level? Or is there grade separation between east-west buses and north-south buses? Because your diagram seems to show a horrendous number of buses having to cross over the path of other buses in at least 2 locations. Removing the buses that came from the suburbs and went straight through Constellation means there are more boarding and alightings for the same number of passengers. Yes there is a very easy fix available. Use the routes and timetable from last week. We could call it the “Old Network” and it could be run out immediately. Yes, I’m sure all the operators under the new contracts will happily take on a different set of routes to what they signed up to. Because the individual express services weren’t that frequent in the afternoon peak a lot of people would catch the direct service via Takapuna instead, it wasn’t much slower. That balanced the load between busway and non-busway services whereas now everyone is funnelled through Constellation. Looking at the journey planner going to Mairangi Bay transferring to an 856 at Smales is just as quick as trying to transfer to an 83 at Constellation and seems like a better bet at the moment. Maybe in the short term they’ll have to reduce NX2 frequency and encourage people to use the 82 and 856 instead – not ideal, but it’s difficult to see what else be done, any reconfiguration of Constellation will take weeks at a minimum. To be fair, the NN on the North Shore is the closest to the old network of any sub-region with the possible exception of Central. But either way something needs to change and I think Matt’s suggestion is a good one: add some platform capacity to deal with local services. The other more immediate option is off-board ticketing. Probably something we want to do at some point anyway. Yup. A few minutes tag points should be a doddle. Couldn’t you just have a bus stop on the approach road from Sunset Drive and have those buses do a loop around the parking lot rather than send them through the gyratory? There’s already a crosswalk connecting it to the busway station, and that easily removes about a third of the buses using the gyratory. +1 Seems the best fix to me. Oh well. That busway thing didn’t work. Everyone back to your cars! It worked until they broke it. It’s obvious there would be no bus congestion problem because nobody uses public transport these days. . . I agree with one comment that said it’s the not so surprising result of a busway that was never completed. Constellation is the end of the line, from there on in its suburban streets, choked arterials, motorways, intersections, mindless traffic light phasing and good ol’ North Shore gridlock to each station north. 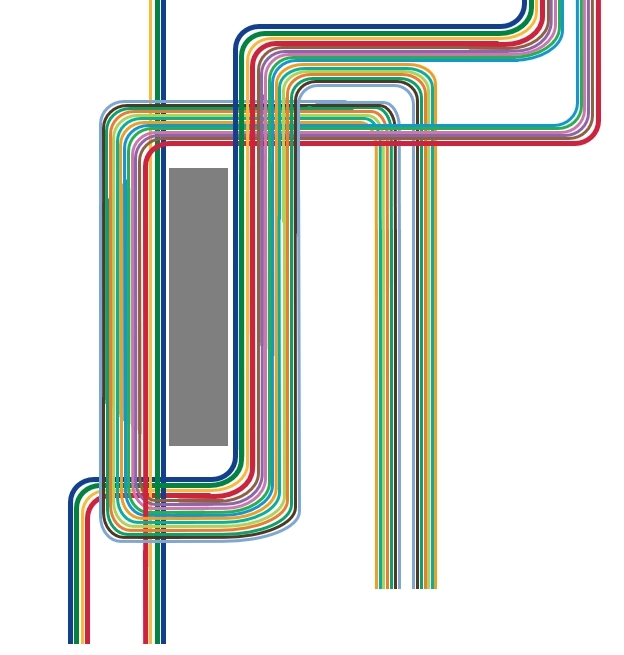 But it is a mess of a layout and was probably at capacity before the new network started. At the NZTA open day for the Northern Corridor Improvements Project a year or so ago, I asked their representative why they were not building the busway extension first. I was told that they had yet to acquire some private land closer to Rosedale Road and that the connection between Upper Harbour Highway and SH1 was their first priority. I still believe they could have delivered the busway immediately beyond Constellation Drive if they had wished to do so. The problem is that this is the end of the line for the dedicated NEX lanes so the station isn’t set up properly for a straight line. I saw it last night at about 6:45pm, there were buses backed halfway up the hill to the Sunset Road overbridge. Total mayhem. Fair comment, its Lincoln Rd on a good day. If West had a bus service worth using, much less a metre of bus lane, it would probably look like that anyway. It wasn’t a bottleneck until some very clever people at Auckland Transport made it into one by requiring most people to transfer there. They said it would be quicker but clearly they didn’t take into account the time it takes to board and alight. There is already a second crossing, between Greenhithe and Hobsonville. We all paid for huge motorways and tunnels to connect to it. The only way I’d ever consider living there would be if they somehow dropped their car dependency. So I don’t think this is funny. This has affected the people who are taking the right steps. tweak it now, asap! Make sure a few more go to city and also build a ferry wharf at Browns bay now. There is not enough parking at it is ! Taking away the parking would be a disaster. There is no feeder bus for a lot of people and more parks are needed not less. I’d say getting hundreds of passengers moving efficiently again is more important than some carparks. If there is a parking shortage it sounds like AT need to charge for parking so those who value it can pay to get certainty of finding a park. Please let’s not confuse ability to pay with valuing something. I’m not sure the provision of free parking at bus stations is really a solution to social inequality. The biggest winners are those who start early, which is often people with more flexible working arrangements. Is your point relevant here, though, Sacha? Nobody has a right to park in the most critical land adjacent to a bus station. The subsidy ratepayers are making to the people parking here is huge. And their use of the land means it can’t be put to far better uses. It’s necessary to reclaim the land. Leaving a small amount of parking, priced appropriately, means that on the one day a fortnight (or whatever) when it really, really, matters that you drive, you can. These people parking are able to walk from the parking lot, and they are able to get up into a bus, so I’m really not sure what their level of need is – it doesn’t seem to be disability. If it is ‘not being on a feeder bus route’ then they can park on a feeder bus route, re-evaluate whether it really is too far to walk to the feeder bus, or re-evaluate their accommodation options. Currently, we are subsidising them. Wouldn’t it be better to establish who are the very few people who really do need a park, and who can’t afford to pay the appropriate price, then subsidise just them? I’m weary of seeing phrases like “so those who value it can pay”. Fair enough. But it doesn’t just mean what you think it means, ie, so that that those who can afford it get it. It also means that most people will decide that on balance, they can’t afford it most days, but on some days, they value the park enough to pay the high price. I can easily see how this arises. You have your system worked out that involves taking the feeder bus, but just before you’re about to leave the house, you get a phone call from a distraught family member, and it makes you late. Some mornings, you can call in to say, sorry, I’m going to be a little late. And some mornings, you have a meeting, so you just have to drive to make up time. And you value being able to do so. Or you’d normally take the feeder, but right now you’re mother’s in hospital and your teenager’s wagging school, and life feels like fighting forest fires, and the ability to pay to get a park really really matters; it’s only going to be for a month or so so the cost is irrelevant in the scheme of things. NOT pricing means you don’t have this ability, because the carpark is full by the time you would normally want to be at the station. And that’s because it is serving the people who are able to go in early, and as Jezza says, these are not necessarily the people who need the parks, or need our subsidy. There are times for intervention, and there are times for letting price modify behaviour. There’s nothing so sacrosanct about park and rides that we can’t let it be determined by price. Sacha I’m with you on this. Lets face it, charging for car parks or roads isn’t going to reserve them for people who value them more, it is going to reserve them for people who have more money. I don’t really have a problem with this if the charges more than cover the cost and value of the resource – this is just capitalism in action and we are a capitalist country (for good reason). But in the case of roads where a congestion charge wouldn’t cover the costs or value of the roads it applies to – this to me seems like a massive subsidy for the rich. Roads that poorer people have helped pay to build, will continue to pay to maintain, and which are on public land, will be too expensive for them to use. Yes, I agree we need to charge fully. Until that gets political acceptance, what’s the interim position? Working towards it with partial charging, to allow behaviour modification that will serve the greater good? Or what we have now, which is not working? There will of course be a discrepancy between rich and poor in terms of how much you value something to be willing to pay for it. This applies for parking buildings, street parking, buying a burger, even a PT trip, why would it suddenly be a concern for Park and Ride. I assume it also concerns you that PT fares are a subsidy from everyone to only those that can afford them? It will depend on who paid for the PNR as to which way the subsidy is flowing. If it is fuel tax then you are right, however if it is rates then it is a transfer from those who have the most expensive house to those who use the PNR. The answer to that JimboJones, is that you subsidize (i.e. invest in) public transport enough that it becomes attractive enough for even the rich to consider not using their cars. Who bothers to drive into cities such as London and Paris when the PT alternative is better for so many reasons? Answer – only those who really must, be they rich or not..
Jezza – yes agree it applies to buying a burger, etc. But I wouldn’t expect publicly owned land or resources to be gifted to a burger chain. Otherwise any person who buys that burger is effectively being subsidised by other ratepayers who can’t afford to. And if that burger was a $50 gourmet caviar burger designed for rich folk (or for those who value it more as you prefer to say), that subsidy is a bit sickening. To be fair my argument is really a dig at road charging not car park charging. Car park charging is likely to give a reasonable ROI back to the council so I doubt there is much subsidy going on. Road charging never will pay for the true cost of the resource that is being subsidised by those who can’t afford to use it (or supposedly don’t value it enough). “Car park charging is likely to give a reasonable ROI back to the council so I doubt there is much subsidy going on.” On purely a land and infrastructure outlay basis, they would need to be charging about $25.day. Once the cumulative effects that the traffic induced by the parking causes are costed, it goes up from there. This is why at the moment, politically, it would need to be a partial cost. Currently, this parking is free. The people who can’t drive and can’t afford a car, are subsidising the people who can. There’s no equity in the current situation. As for the burger analogy, one way to look at it is: What industry in this country is NOT being subsidised? Particularly, by future generations? Think water pollution, the numerous landfills that they’ll have to deal with, climate change, land used for grazing that is need for biodiversity… absolutely it’s true that “publicly owned land or resources [are being] gifted to a burger chain” and to almost every other industry. What about charging for car parking and using the money to decrease the fare from that stop? Tricky but with technology could be done in some form. Dossiher, can you leave your house without a car? I’ve been thinking about this all day and I think that we can solve most of this really quickly. The new busway station already has resource consent right? So can AT/NZTA phase the construction to build the northbound platform ASAP? northbound bus way buses would then turn right down the bus road to Parkway Drive which would require a small segment of bus way, most of which is already covered by resource consents for the bus way extension. I understand that building the whole station would take a long time, but surely a carriageway and concrete pad with basic shelters could go in very quickly and cheaply. The overhead crossing would have to wait to, which probably means a signalised crossing or zebra crossing on a raised platform for a few months. This would get northbound busway buses off of the gyratory altogether which will massively help congestion. Of course, a big part of the problem today would have been people not knowing which bus to catch and therefore slowing down boarding and alighting. This will ease with time. +1 Sailor Boy. This fix could literally be done over a few days. The pedestrian crossing wouldn’t be ideal for anyone but would do the job. I would say it would need to be signalised to prevent 1 person stopping half a dozen buses each time they cross. Whole thing could be done for $150k with shelter on top of that. Sorry should say $350k… concrete platform x 60m, basic traffic lights, 80m of tarseal. A temporary pedestrian bridge made from scaffold could be built in a day. Very creative arrangement for parking there. What’s the point of having an underpass to the busway which is not high enough for buses? What was originally the purpose of that lane? It was build for carpool access. The predecessor of NZTA didn’t actually believe anyone would take the bus, so they insisted the busway be designed so it could be converted to an HOV lane when it ‘inevitably’ failed as a public transport line. Needless to say it was a huge success and the car access to the busway was never opened. Absolutely correct, car pool access. Scroll down to “Can car pools use the Northern Busway” and click it. Now if only the money wasted on that underpass had been spent on an additional bus platform…. It really shows how mode-biased the funding systems are that critical public transport infrastructure is built as cheaply as possible while expensive provisions for vehicles are easily included in projects, even if they end up being totally useless. The conclusion was that focusing on carpooling was the wrong strategy. Had they been focusing on reducing vkt there would have been reductions in carbon emissions. So it would make you wonder why AT still includes budget for trying to increase carpooling, and why SO MUCH of its budget is on road expansion projects that increase vkt. Yes, I spotted that ‘creative’ parking last night too. I wondered if it was for taxis originally, or for some easy access for the police to the motorway, so thanks for the explanation, Nick. Given that driving on traffic islands is illegal (RUR), and this parking normalises the practice, having the police neighbours ignore it is kind of typical of their attitude. No thought to the cultural practice of bad driving and parking that their lack of enforcement encourages – people driving on traffic islands contribute to our bad safety record, citywide. Haha holy moly, THIS is why Auckland needs SUVs! Almost as bad as the Akoranga mudfest parking. This morning north shore traffic congestion is crazy even on school holidays – as most people living north shore are driving today. Auckland Transport’s Group Manager Metro Service Delivery, Stacey Van Der Putten says the station couldn’t cope with those numbers. “We have a plan to manage the number of buses and improve efficiency for our customers. Cool! Makes it feel like a proper big city when we have dozens of queued buses. So Constellation was close to capacity before the change that added a huge number of bus journeys to it. Have I got this right? If so, they surely would have modelled the new numbers, wouldn’t they? This seemed to have come as a surprise. How is that possible? I guess with in the perfect world it would of worked, 1 min gaps etc, but with bunching and realities of first day it was likely to fail. Every model is wrong to some extent. But if you don’t allow for random arrivals and bunching in your model you shouldn’t be doing the modelling. Cause that’s unrealistic. Rubbish in, rubbish out, is what modellers say. I understand that the North Shore RTN study identified Constellation Station as a bottleneck back in 2016 so it shouldn’t have come as a surprise. The report basically had a whole section on the life expectancy of the busway…I believe it was commissioned by AT too. (Understood, but 🙂 As a Norwester, I dream of having so many bus services turning up at a modern interchange in the north west…. “Auckland Transport spokesperson Mark Hannan said 91 buses arrived within half an hour. These 37 could just skip this station instead but would cause a headache for users I guess. Also the next zone kicks in past Constellation. So instead of solving the problem, they run away from the problem. It is at least a fast initial response, to be fair. Proper fixes will take weeks. Still doing better than Welli. I guess so. But I would have though coning off some of the park and ride and changing the routes of the buses through the interchange could have gone a long way to resolving it, without loss of service. When I think about it 91 buses within half an hour, there is no way that station would of coped with that. I travelled through it going north today around 9:30am and even then was slightly clogged up with buses in the way. If a lot of passengers have switched to the NX2 there’s no point running half full NX1s every 3 minutes, you might as well fill them up and run them every 6 minutes, halve the number of buses in use and still have great frequency. Yes!!!! I counted the same rate for the NX2 while standing at the Civic stop in Wellesley St about the same time. For about 20 minutes while I stood there, they were coming every minute or two. Some were waiting at the lights diagonally opposite Smith and Caughey while there was already one picking up passengers at the Civic stop. Grade separation needed ! Its the only logical answer ! Looking forward to the Northern light rail line . . .
How quickly does this bring forward the Busway being at capacity and the move to rail (LR/HR/metro/whatever) being necessary? Absolutely it is time to start work on a North Shore light rail line because even if work started tomorrow it would be seven years away. And for those who worry that the North Shore gets all the goodies then we (Shore people) should pay for it just as we paid for the Harbour Bridge. Essentially motorists will be paying to keep the road congestion free to allow them to continue to drive. – 7yrs would require a Labour Govt to have spades in the ground ahead of any govt change, as National unlikely to support. OK – maybe it’s time to have a very serious rethink about the AMETI Eastern Busway project, which aims to deliver buses at high frequency to the Panmure interchange through a complex new intersection replacing the Panmure Roundabout. This event does not bode well for that project! There’s nothing particularly complex about the proposed intersection, there will be no buses having to cross over buses and they will be running with main flow of traffic. But there will be plenty of other traffic having to cross over buses at the intersection, including heavy commercial vehicles. If the light phasing is designed to always give priority to the buses, this could easily cause traffic back-ups from other directions – including right into the Panmure Town Centre, which is already predicted to suffer a 30 per cent increase in vehicle movements as a direct result of the new intersection design. The AMETI planners have always known that their intended design will have the effect of forcing more vehicles into the town centre as a result of the 50 per cent loss of capacity on Lagoon Drive but they don’t want to acknowledge it. I’d love to know more, Keith. Can you write a post? Yes, I can, Heidi. I presented a great deal of evidence and information to the Notice Of Requirement process on this, so I will condense that to a post for you shortly. Super. Look forward to it. Hi Heidi. I’ve submitted a post on this. Just waiting to hear back from GA.
A number of bypasses have been built around this area in the last 20 years with Waipuna Bridge, South Eastern Highway and Te Horeta Road. If people are determined to still rat run through this area they might just have to put up with being lower priority than high occupancy buses. You seem to be complaining about people rat running through the Panmure Town Centre but also complaining they will get poor light phasing. The problem with the design of the AMETI project is that it will completely undo any benefits that may have accrued from those projects. In addition, it does not take into account the fact that a large proportion of the traffic flow that passes through Panmure is not city-bound commuter traffic and therefore will have no use for the AMETI Eastern Busway. And it is not the people doing the rat-running through Panmure who will be most inconvenienced by the design, it is the people who actually LIVE in Panmure that will suffer the most but whose interests have been dismissed as unimportant in the greater scheme of things. Bear in mind that, despite the long-standing PR position on AMETI, the project was never designed to serve Panmure – it was always only intended to use Panmure to serve the interests of commuters from east of the Tamaki River. Leaving things as they are has done a pretty good job of undoing the benefits. Leaving the roads with the same capacity as they had before has meant they have started filling up again. There is no way Lagoon Drive needs 4 lanes when this used to handle the entire eastern suburbs traffic. As a Panmure resident replacing the roundabout is a significant benefit as is Te Horeta Rd, so I don’t agree it doesn’t benefit Panmure. The new intersection will be much easier to cross as a pedestrian than the current roundabout. If people want to use the Town Centre as a rat run good luck to them. There is a barnes dance and two pedestrian crossings to keep the flow down. • limited capacity, slow travel speeds and variable travel times for the missing segment of busway between Constellation and Albany. • inadequate size and capacity of Constellation Station to accommodate a large volume of bus services and passenger demand. However, by 2026, the joint AT/ NZTA Northern Corridor Improvements (NCI) project is anticipated to have completed the missing section of the busway, constructed a new Rosedale Busway station and provided and additional platform to Constellation Station, therefore improving these deficiencies. Did AT run a simulation to confirm Constellation Station would continue to work properly before making the changes? I asked exactly the same question; see discussion above. Buses have a limited capacity. Sending one bus a minute over the bridge for the shore, some analyst must have questioned the station capacity, you would have thought. And the same AT folk want to send one bus every 5 minutes down Dominion Road. Seize the opportunity AT – bring forward the light rail link from Britomart under the harbour to Silverdale. Stop procrastinating, bus technology has its limits! I went to the public session of the AT Board meeting today. You wouldn’t have known that there were northern busway issues. Shane Ellison said he was out and about yesterday looking at things. (He didn’t mention whether he was on a bus.) I guess though in a public session you wouldn’t question your chief executive about the shambles that was Constellation. Please don’t ask me to express the degree of confidence that I have in the current Board to effect transformational change. What made the difference between last week and this week at Constellation Station? A number of things , the people, the buses, as a type of vehicle, Hop cards were very similar. What changed were the number of buses and their source and destination. Some buses were similar. The biggest change of type was removing the buses that start in an East Coast Bays suburb travel through Constellation station into the city. One of these typically could have 40 people when it arrived at Constellation. 10 more may board and it leaves. So it’s time parked at Constellation was 10×3= 30 seconds. Assuming 3 seconds to board a bus. Now these 40 people arrive on a feeder bus. This takes 40 seconds to unload. The 40 +10 people board another bus.so 50×3= 150 add 40 and you have 190 seconds. So for every 85 x, 86x and 87x that was stopped you have a bus parked at Constellation for 160 seconds more. “Constipation Station” as it’s been nicknamed. I’d been thinking ‘consternation station’, but that’s better!